“Muzsikás” is a name given to musicians playing traditional folk music in Hungarian villages. After forty years of their unrivalled career, the Muzsikás group is one of the most renowned and popular Hungarian folk music ensembles worldwide and in their home-country as well. 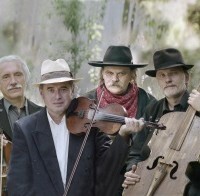 Due to their unique musical skills, instrumental knowledge and musical versatility, they can cope with playing on different music scenes, collaborating with various noted musicians and groups, from folk and world-music to classical, klezmer and jazz, and even to alternative rock music.